Are you on the hunt for summer activities for preschoolers and kids? Search no more because we have you covered. Boredom busters do not have to be expensive and over done. Sometimes we forget about the simple things when we are searching for activities for our kids. Things like skipping rocks, playing kickball and feeding the ducks should never be forgotten. They are inexpensive ways to build lasting memories together. Below is a list of 25 activities for kids that are sure to be crowd pleasers for you and your little one(s). Create a letter of the week craft as you teach them their ABC's. Go for a Sunday drive any day of the week. Here is a list of 10 activities for 2 year olds to keep them busy in the car. Play with Matchbox cars in the dirt. Take a trip to the local library. Here is a list of the best children's books for learning to count. Re-purpose broken crayons into your favorite shape. Visit your local toy shop and just play. You don't have to buy anything. Some of them also offer free story time. Make a bird feeder out of recycled items you already have on hand. Play dominoes. You do not have to play by the rules - think outside the box and build something with them. Go garage sale shopping together. You can find board games, movies, etc for cheap, cheap! Use juice and fruit to make your own healthy popsicles at home. Become pen pals with someone or write a letter together. Preschoolers love to draw pictures for others. Make a trip to the Post Office together to mail your letters. My kids think the Post Office is so fun. Make a lemonade stand. Here are 10 lemonade stand ideas. Play dress-up with old costumes. Go for a walk at the mall or the park depending on how hot it is where you live. Play hide and go seek in the house. Watch a movie together. Let them pick it out (with guidelines obviously) at Redbox or on Netflix. Stay in your pj's and watch the movie. Build a fort out of blankets and kitchen chairs. 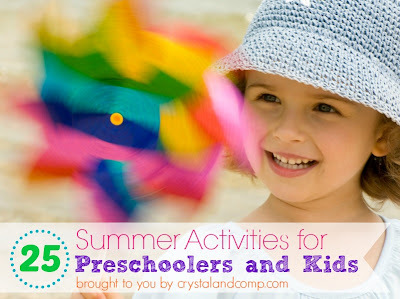 How are you keeping your little ones busy this summer? 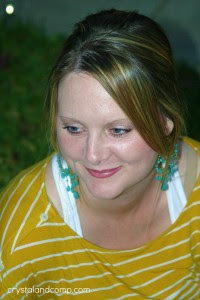 Crystal is a Dallas Mom Blogger, who runs the mommy resource and solution site Crystal & Co.! She loves to share activities for kids, teach busy families how to meal plan and share real easy recipes. She is a fast-paced mom of all boys, five to be exact (including twins), who is in the trenches of homeschooling. Sending this list along to the parents of my grandchildren. Thanks so much for sharing! Great list! We had a few of them on our Rainy Day blog as activities that were perfect when you couldn't play outside.